1. Someone who specializes in the study of disorders of spoken language and their management. 2. An expert or specialist in phoniatry. 1. The study of the voice and medical treatment of its disorders. 2. The analysis, assessment, and management of disorders of spoken language. 3. The sciences of the voice, speech and speech training, the problem of the deaf and mute, and musical problems and techniques. A specialist in the scientific study and medical treatment of the defects and disorders in voice production. A reference to the treatment and cure of mental disorders. Healing, medical treatment; healer; phthisiotherapy. A physician who specializes in physiatry (rehabilitation medicine). 1. That branch of medicine which deals with the diagnosis, treatment, and prevention of disease with the aid of physical agents; such as, light, heat, cold, water, and electricity, or with a mechanical apparatus; physical medicine. 2. An old term for physical therapy. 4. The doctrine or system of natural cures. 5. The applications of natural agencies in medicine. 1. A physician who specializes in physiatrics. 2. A physician who specializes in physical medicine. 3. A health care professional who administers physical therapy; a physical therapist. 1. 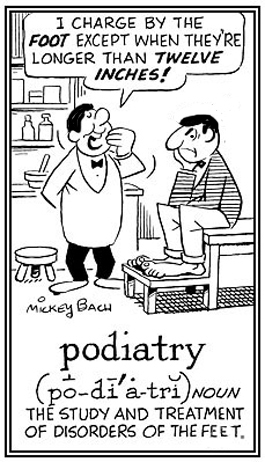 Someone who practices podiatry (diagnosis and treatment of disorders of the feet), a chiropodist. 2. A specialist in podiatry; formerly called chiropodist. 1. The branch of medicine that deals with the examination, diagnosis, treatment, and prevention of diseases and malfunctions of the feet and their related symptoms: Podiatry is concerned with many different types of foot problems, including walking disorders in children, ankle injuries among adolescents, fractures among athletes, and the care of foot ulcers, toenails, and infections among people who have diabetes. 2. Etymology: from Greek pous, pod-, "foot" + -iatros, "physician." © ALL rights are reserved. A medical doctor who specializes in the treatment of ailments caused by beards. 1. A system of therapy in which misdirected neurophysiologic reactions are made perceptible (as by the oscilloscope, electromyograph, etc.) and used as a guide in recognizing and correcting such undesirable responses (dysponesis). 2. A technique of training which is dependent on the perception of errors by the observation of physiological parameters; such as, biofeedback training. A person who pretends to be a physician on the basis of some self-acquired knolwledge.